Chester Alan Arthur (b. October 5, 1829, Fairfield, Vermont – November 18, 1886) was the 21st President of the United States (1881–85). He assumed the office upon the death of James Garfield who was felled by an assassin’s bullet and a host of doctor’s who eschewed sanitary conditions when treating him. Arthur had been a political appointee in the New York City Republican political machine which meant expectations for him as president were low. To the surprise of many, Arthur stepped up and embraced the political reforms that he and Garfield campaigned on. After his term, in poor health, Arthur only half-heartedly sought the re-nomination for the presidency in his own right in 1884. Grover Cleveland succeeded him. President Chester Arthur died two years later at the age of 57 years. 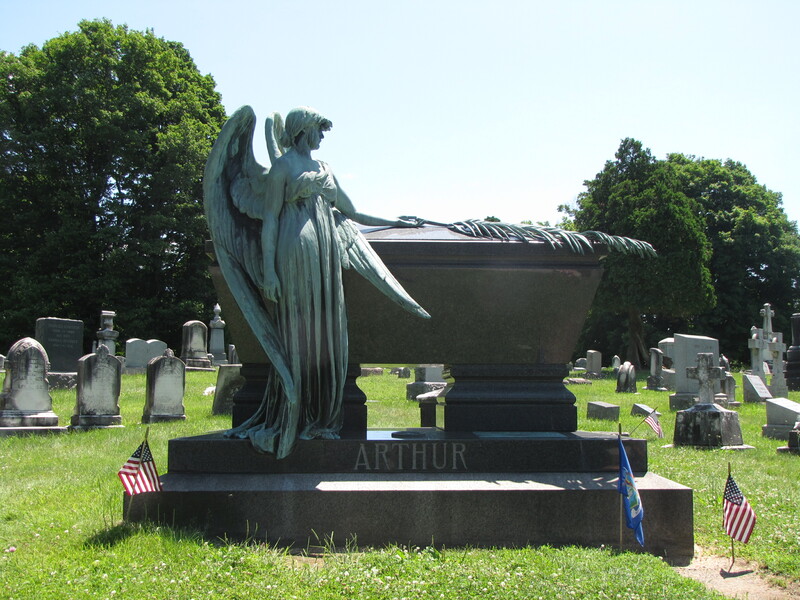 After a private funeral service in New York City, Arthur was laid to rest in the Albany Rural Cemetery at Menands, New York. In 1889, a large granite sarcophagus was designed for his monument. 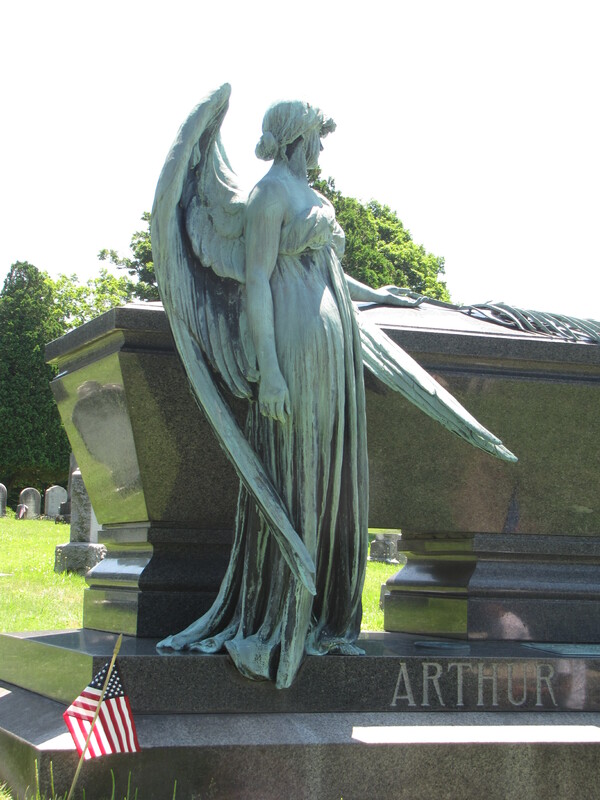 Noted American sculptor Ephraim Keyser, created and cast a large bronze female angel that is depicted placing a palm leaf on the top of the tomb. The palm leaf represents victory over death. 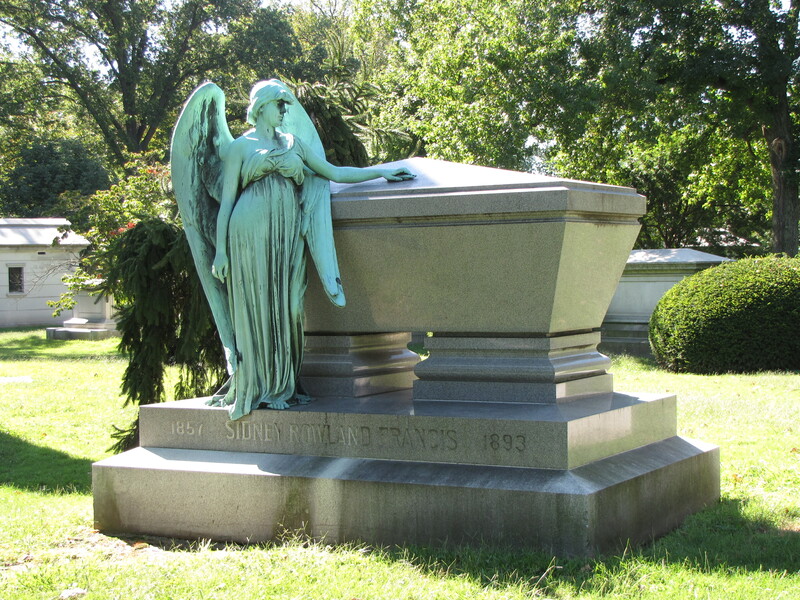 Not long after the creation of Arthur’s memorial, Sidney Rowland Francis, brother and law partner of the Governor of Missouri died December 4, 1893, at St. Louis, Missouri. 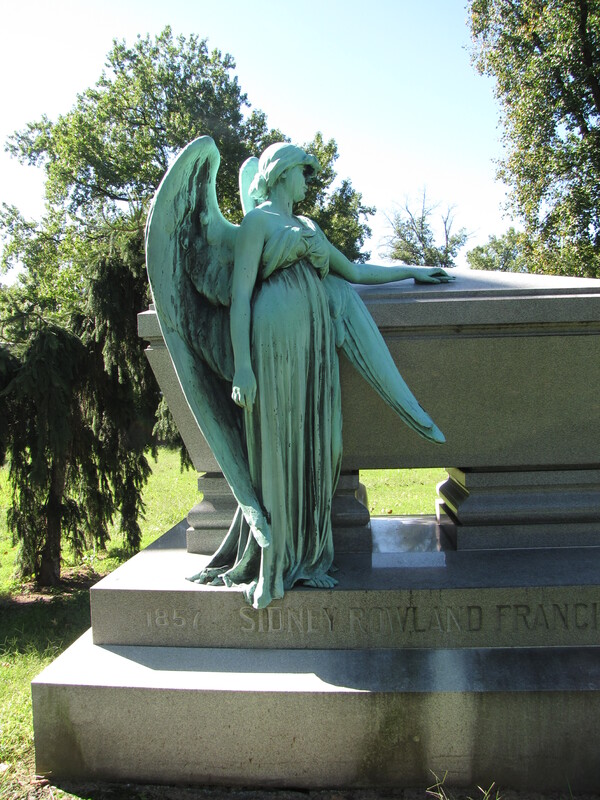 Francis was buried in the famed Bellefontaine Cemetery in that city. With the exception of the hand turned down as opposed to up and the absence of the palm leaf on the top sarcophagus the monument, angel and all, created for Francis’ grave appears to be a look-a-like of Arthur’s.